An Anniversary Omega Constellation Pie-Pan? Just recently, I wrote an article for the German WatchTime portal about Omega’s Constellation and the uncelebrated anniversaries of both the original 1952 model and the 1982 ‘Manhattan’ edition. Just now, I noticed this teaser image on Omega’s Facebook page (over 200.000 fans today). In case you’re not on Facebook or not one of the 200,000 people, below is the image they just released. For those of you who can’t read German, I will re-post the English version of the Constellation article I did for WatchTime below. I guess some of the conclusions are old now (already), but it still gives you a nice overview of what happened with the Constellation collection through the years. For some reason, Omega decided to focus on the 50th anniversary of the First Watch in Space other than to commemorate another great collection, the Constellation. In fact, 2012 is a year that could commemorate two introductions of the Constellation. The very first Constellation in 1952 and the revived Constellation ‘Manhattan’ model (on which the current Constellation collection is still based) in 1982. 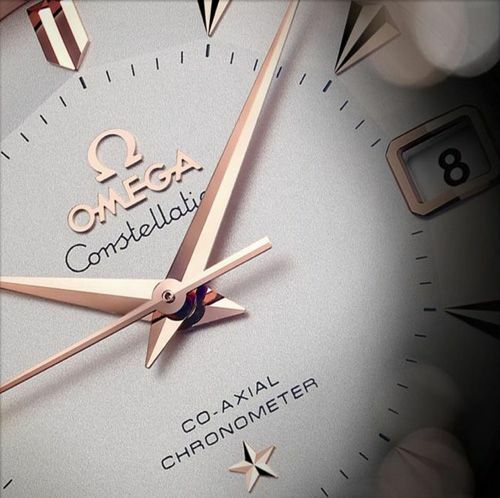 It was 60 years ago when Omega introduced the Constellation. The Constellation was the flagship of their collection, where luxury met accuracy. All Constellation watches were chronometer certified by the COSC. Before 1952, Omega did produce watches with these qualities under the ‘Centenary’ collection, but it has never been produced in series. In the 1950s and 1960s, the Constellation was a feared competitor by many other luxury brands. 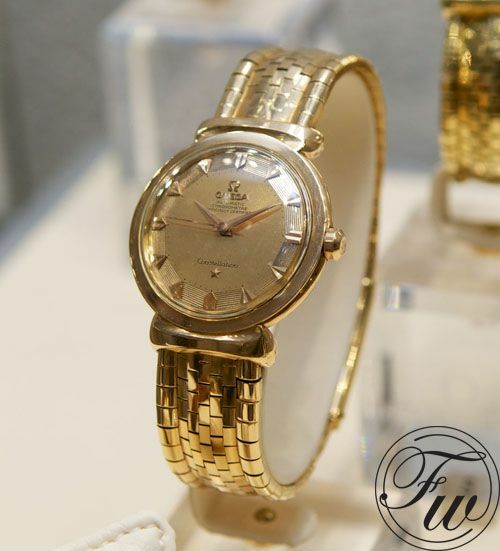 The Constellation collection ranged from stainless steel watches to platinum versions (Constellation Grand Luxe), but all with a lot of finesse and the same high precision Omega movements. The very first Omega Constellation models had an automatic winding movement with a small oscillating weight being referred to as a ‘bumper’ or ‘hammer’ movement. The oscillating weight of this type of movement is limited by buffers and does not make full rotations. 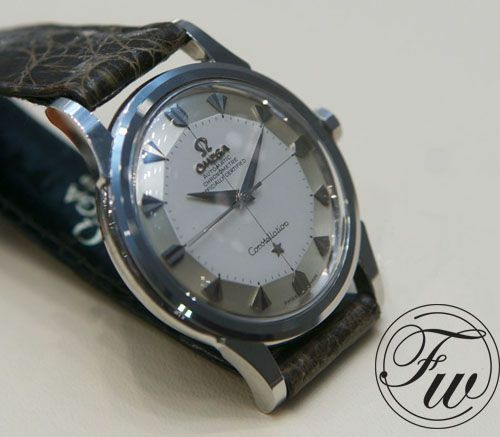 Not much later in the 1950s, Omega started to use movements with a normal oscillating mass as how we know it today. Very early Constellation with special enamel dial by Stern (ca. 1952 – 1955). The Constellation collection consisted of elegant watches with a wide range of dial variations. For collectors of these watches, the most sought-after models are the Constellations with a ‘pie-pan’ shaped dial. In any case, the finish of the dial, hour markers and hands were always of superb quality. Hour markers were always made out of gold or a combination of gold and onyx sticks. All Constellation watches had chronometer certified movements. Although some of the used calibers in these watches correspond with movements used in other collections like the Seamaster and Geneva, only the ones used in their flagship line were certified chronometers. 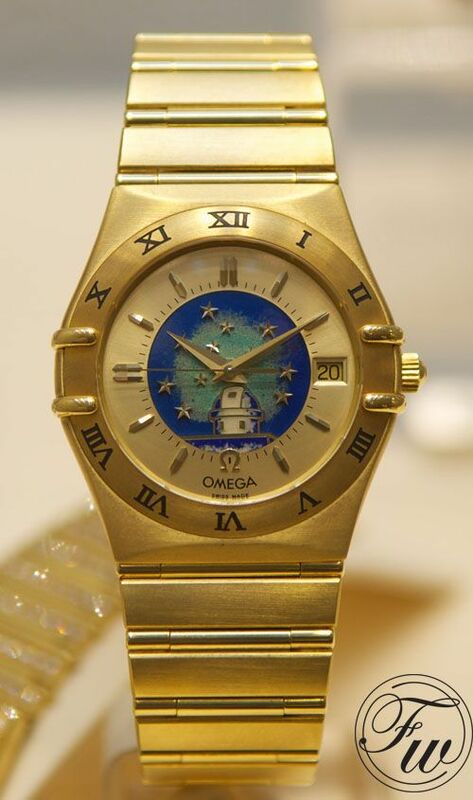 The case backs of the Constellation, even for the stainless steel models, had this gold patch with embossed Geneva observatory and starry sky. All good things come to an end though. In the 1970s, a lot of different variations were produced for the Constellation. Although some are very interesting for collectors, they lost the elegance and luxury look & feel of the early Constellation models. according to many. One of the most interesting 1970s Constellation is the Constellation Megaquartz f2.4MHZ. An electronic watch that was introduced in 1972 with a super precise movement. One of these Megaquartz models had a dial of aventurine, a material that perfectly fits the watch with the Geneva Observatory and starry sky engraving. 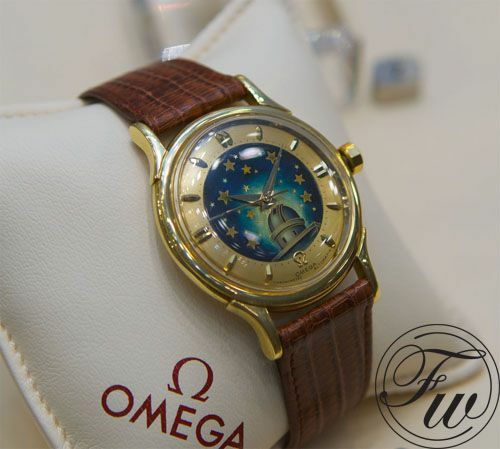 It wasn’t until 1982 when Omega refocused again on their previous flagship model and came with a whole new design. The new collection, referred to as Constellation ‘Manhattan’ embodied the acceptance of stainless steel and integrated bracelets for luxury watches. With its 4 claws, pressing the sapphire crystal firmly on the case, its integrated bracelet and chronometer certified movement Omega entered a new path for their previous flagship model. Although it came out with a quartz operated chronometer certified movement at first, Omega decided to use automatic winding movements as well. In the 1980s, this watch could be seen on the wrist of famous people like Russia’s former president Mikhail Gorbachev and actor Robert Wagner. 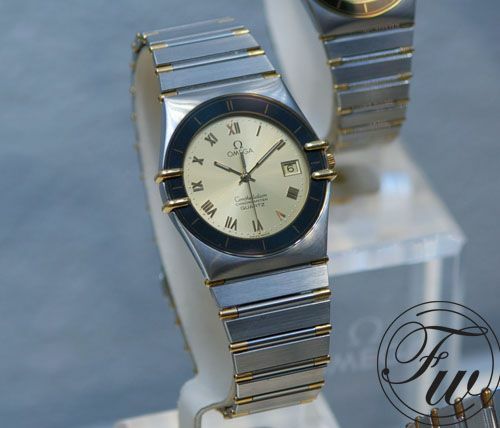 A few years later, Omega started using ambassadors more prominently and people like Cindy Crawford, Martina Hingis, Pierce Brosnan and Anna Kournikova have been repeatedly pictured in the Omega catalogs wearing Constellation watches. The Constellation ‘Manhattan’ received an update in 1995 and although the typical 4 claws and integrated bracelet stayed, the edges received a more smooth look and feel and the hands changed into Dauphine type hands. Dials were either mother-of-pearl or had a guilloché finish. Although the current Constellation models have received new updates through the years, the ‘Manhattan’ DNA is definitely still there which shows that the original 1982 design is one with a timeless character. The design has become more ‘bold’, men’s watches grew in size and got a more sporty character. That having said, there are almost no similarities anymore between the original 1952 Constellation and the current collection that clearly has its roots in 1982. The current Constellation collection is extremely popular in Asia where in Europe there seem to be a preference for watches with a more sporty character. For those longing for the original Constellation, have a look at the De Ville series that has been (re)introduced in 1999. Omega introduced a new De Ville collection with George Daniels’ Co-Axial movement. The design of the De Ville shows many similarities to those very first Constellations of the 1950s and 1960s. A collection that celebrates its 60th anniversary and a specific model or design that has been in the collection for 30 years – like the Manhattan – is something worth celebrating or at least worth mentioning. I hope the new Omega Constellation with pie-pan dial can live up to our expectations! The preview photo of the pie-pan dial, diamond shaped hour markers and dauphin hands looks very promising.